During the launch event of OPPO R17 last November 7, Ms. Anfeng "Jane" Wan, OPPO Philippines' Vice President of Marketing, announced that OPPO is the number 1 smartphone brand in the country, and this is confirmed as per the published report of Canalys. According to the report, OPPO garner a total of 20% market share in the Philippines, beating Cherry Mobile, the one who holds the position for quite some time, by about 0.7 percent. This is quite impressive, considering that smartphone shipments in the country is down by 3.1% year-on-year. “OPPO’s performance was most notable, as it was the only vendor that appeared in the top three in all five of the largest markets,” said Research Analyst Jin Shengtao. Its best performance was in the Philippines, where it overtook local king Cherry Mobile to lead for the first time with a market share of 20%." The success of OPPO can be attributed to their aggressive and relentless marketing efforts in promoting their popular devices such as OPPO A3s, OPPO F7, OPPO F9, and OPPO Find X to name a few. "Feel proud! Everyone knows how hard it is in this competitive industry, but we have the confidence in serving more to Filipinos!" said Ms. Jane Wan. What can you guys say? 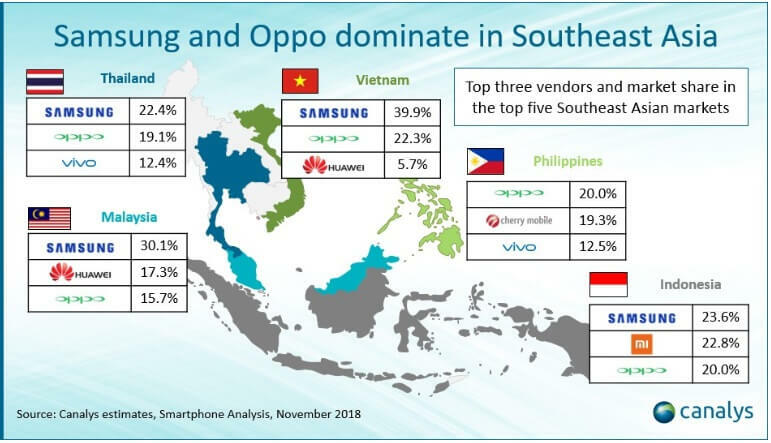 Will OPPO continue to dominate the Philippines smartphone market? Or Cherry Mobile will bounce back this Q4? Share your thoughts in the comment section below.